The 2018 PDAC International Convention, Trade Show & Investors Exchange took place in Toronto, Canada from 4-7 March. The event is considered the premier international convention for the mining sector and attracted over 25,000 people from 135 countries. Some individual member states have participated in the 4-day conference in the past, but the EU had an official presence for the first time this year. The EU presence was achieved through three main events: A by-invitation seminar and cocktail reception to explore the impacts and benefits of upcoming CETA legislation on the Mining and MSS sectors; EU-Canada Exploration and Mining Day, a full day show case for Member State representatives and EU-based technical innovation; and a featured 4-section trade show booth for the duration of the convention. Participation in the PDAC was the third and final major event of a study commissioned by the EU in January 2017. The study aimed to assess the viability of an EU-Canada strategic partnership in the non-energy extractive industry (NEEI). The study first examined the baseline level of integration, cooperation and investment between the EU, Member States and Canada. It then looked for opportunities to improve the investment framework leading to increased investment flows and improved business links between Canada and the EU in the NEEI. 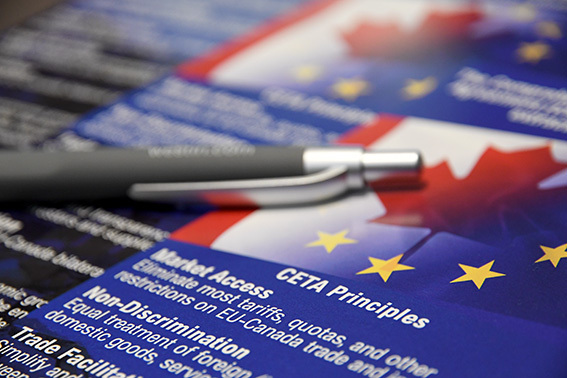 Finally, the study engaged with stakeholders to assess the level of demand for an EU-Canada strategic partnership in the NEEI and to define the objectives and operating model of the partnership. As Euromines is a partner of the EU-CAN project, Euromines President Mr. Mark Rachovides actively contributed to and participated as a speaker in the EU’s events at the conference.